The Green Girl is the very proud owner of a brand new 43 cm Trek Lexa SLX in Satin Crystal Pearl White/Sparkling Silver/Platinum. A few months ago, I announced I had registered for a 240-mile bicycle tour. I had anticipated a limited selection of options due to my height but I had no idea how impossible what a challenge it would be to find a road bike small enough for someone as short as me in stock in a local store so I could try it before I purchased it. I am exactly 4'10.5" tall with an approximately 27" inseam. I discovered I have a long torso for someone my size so most people my height actually have much longer legs. I realized I would never be able to touch the ground while on the seat - the objective was to find a bike with a low enough standover that I could actually stand over it. When I was about to withdraw from Tour DaVita after endless phone calls, weekends dedicated to going from bike shop to bike shop, bike stem sawing, and lots of tears of frustration, a kindred spirit by the name of Peggy from Two Wheels One Planet called me after getting my desperate plea message. Based on my rambling, she was confident she had found the bike for me. By this point, I knew what didn't work but I wasn't 100% certain what would work for me and I was ready to take a leap of faith after she read me the dimensions. Peggy said she talked to Trek and they had one bike in this size in a warehouse somewhere in California. Sight unseen, I purchased the Trek Lexa SLX in the XS 43 cm size. When the bike arrived, Peggy sent me an email to let me know it was assembled and it was small. I stopped by Two Wheels One Planet after work today and saw my Trek Lexa SLX for the first time. I'm in love. She's beautiful. And she's so tiny that she fits in my car without having to remove one of her wheels. That's going to be a great bike for you. Nice score. I think you left something out of this post: What's her NAME????? She's a beauty, that's for sure! Ride her in good health. So awesome!! Congrats on the great bike find! Now you must name her =) I'd name her Tiny. Don't worry I cannot touch the ground on my bike either, however I am a little taller than you (a whopping 5'2"). ENJOY your new best friend! The Tiny Trek! Congratulations on persevering. Nice bike! I am jealous. Sweet new ride. I'm getting increasingly jealous of all the folks with their shiny new bikes. Should make for some great cross-training for you. Congratulations!! I had been wondering about the bike/training. Now that is customer service - a story like this makes me want to buy a bike from that woman. Happy riding! Being a tad over 5'4" with short legs - i have run into the same issue. I have found Trek's in my needed size hard to find. So, i know what a FIND this is. have fun! Awesome, you'll have many happy miles on her for sure. I like the "Tiny Trek" idea from Kovas. Somehow I think you might go for something more Zen... Enjoy the bike training! What a great looking bike. You are going to have so much fun flying along the bike path and during the race. very cool. I can't believe you didn't hit us up to help !! Well it's done now and I hope you enjoy every step of your journey. Exciting!! 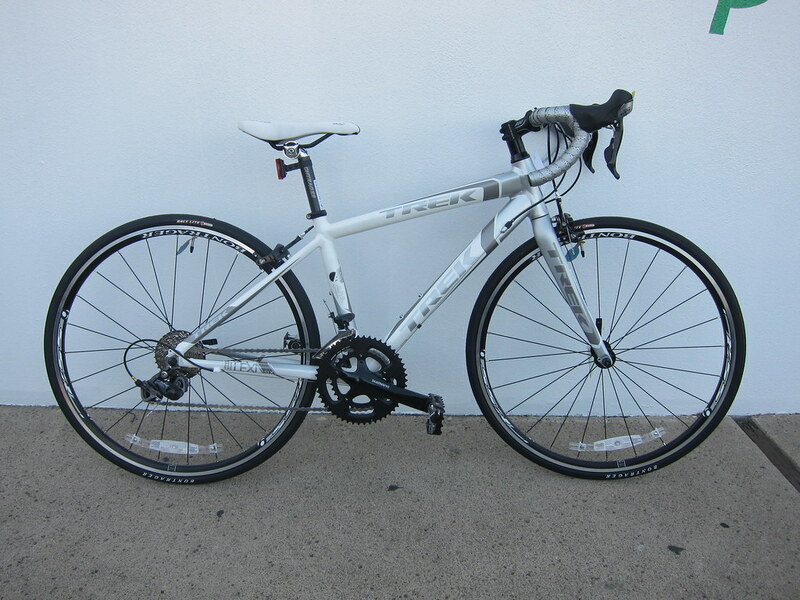 I ride a Trek hybrid, but love the road bike. Sweet ride G.G. If Patrick approves it, it must be good. She is a beaut. After I've taken it out for a few more rides, I will write a detailed review.